CABLE HIGHLIGHTS: TNT’s NBA doubleheader was at 0.97/0.79. USA’s WWE telecast was at 0.95/0.85/0.77 compared to last week’s 0.93/0.91/0.90. On VH1, LOVE & HIP-HOP slipped 0.02 to 0.72, and CARTEL CREW was down 0.05 to 0.40. On MTV, TEEN MOM lost 0.06 to 0.59 (with a lead-in hour at 0.29), and MADE IN STATEN ISLAND was down 0.05 to 0.20. On Bravo, VANDERPUMP RULES rose 0.07 to 0.53. 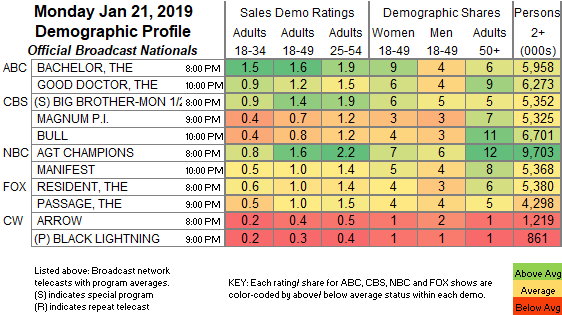 Food Network’s KIDS BAKING CHAMPIONSHIP dropped 0.08 to 0.45 (with a lead-in hour at 0.29), and WINNER CAKE ALL was down 0.08 to 0.24. On Discovery, STREET OUTLAWS fell a tenth to 0.34. ESPN’s COLLEGE BASKETBALL game was at 0.34. Nickelodeon’s noon PAW PATROL was at 0.33. 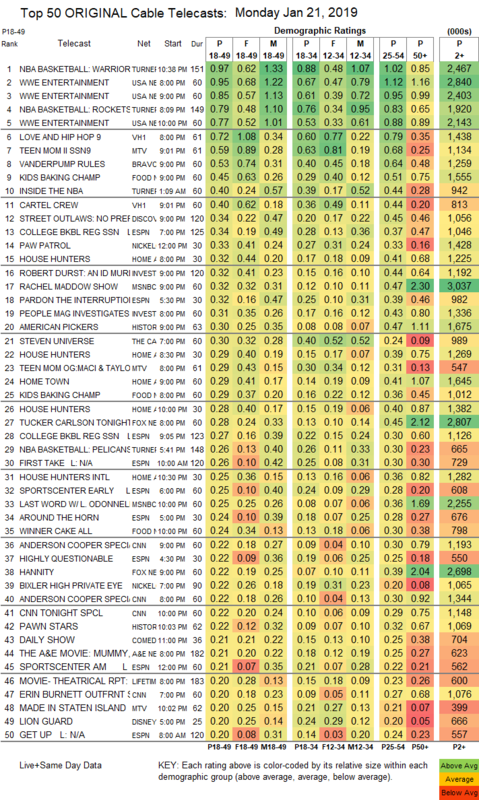 On HGTV, HOUSE HUNTERS was at 0.32/0.29/0.28 compared to last week’s 0.31/0.24, HOME TOWN ticked down to 0.29, and HOUSE HUNTERS INTL was down a tick to 0.25. On ID, ROBERT DURST: AN ID MURDER MYSTERY was at 0.32, and PEOPLE MAGAZINE INVESTIGATES was up 0.05 to 0.31. MSNBC’s RACHEL MADDOW SHOW led cable news at 0.32/0.47/3M, with Fox News’s TUCKER CARLSON TONIGHT at 0.28/0.45/2.8M, and CNN’s ANDERSON COOPER 360 at 0.22/0.30/1.2M. History’s AMERICAN PICKERS jumped 0.13 to 0.30, and PAWN STARS was at 0.22. TLC’s INSEPARABLE was at 0.13.